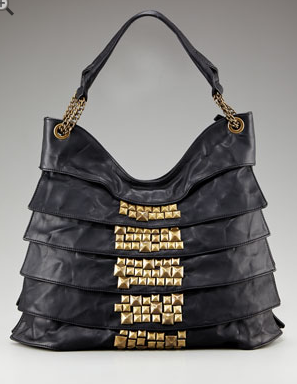 While perusing the New Additions section on Neimans website, I found two handbags I must have. Since my handbag obsession has taken a quiet haitus since I moved to Hawaii, I probably won’t get either. But that doesn’t mean I can’t still crave both–or encourage YOU to get them! These bags are polar opposites–but only in price. One is $2495 and the other is $255. One is a popular and high-end brand, the other is an eco-friendly, vegan brand. But, they are both considered hobos and they’re both super cute. So enough with the teasing… let’s see the bags! I mean, how friggin hot is this bag? I LOVE IT. 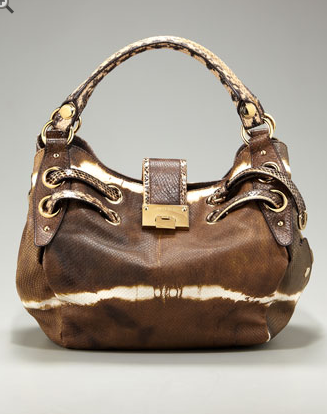 It’s a Jimmy Choo camel brown python-embossed leather with off-white tie-dye detail. I generally don’t love tie-dye but it works on this bag. The hardware is great, the shape is fabulous, and I like that it has tan suede lining. It’s just a great spring/summer bag. Man, Jimmy Choo makes hot bags. And yes, this is the $2495 one. Man, I really do love handbags.